The BBQ prep for the closing dinner. Just got back home from a wonderful weekend down in Paso Robles attending the 2018 Hospice du Rhône. This was my first time attending the event and I can tell you that my wife and I are already making plans to attend the 2020 event April 23rd-25th. To be honest, we are even thinking about attending the 2019 event in the Rhône Valley. 4 seminars featuring 9-11 wines each including many wines with limited releases and very small production. An Opening and Closing Tasting featuring hundreds of wines with each tasting having a different theme (older vintages for Day 1 and newer vintages for Day 2) so each day had different wines to try. 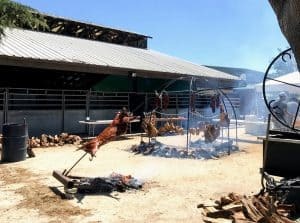 As you can probably garner from the first paragraph, my wife and I left the event feeling that the cost of the weekend pass was more than worth it for the experience we got. So I’ll share some of my favorite geeky moments, top wines and the two slight negatives that put a damper on an otherwise stellar event. 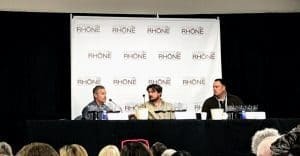 I’ll save my reviews of the 4 seminars (South Africa’s Cinsault Renaissance, A 6th Generation Crusade in the Barossa Valley, Lost and Found: Old Vine Rhônes Across California, The Majesty of Guigal) for their own individual posts because there was a lot of great stuff from each to unpack. Meeting two Masters of Wine in Billo Naravane of Rasa Vineyards and Morgan Twain-Peterson of Bedrock Wine Co. I got a chance to talk to Billo about the possibilities of Walla Walla hosting a future Hospice du Rhone (would be incredibly exciting!) and with Morgan it was hard not to be charmed with his unabashed geekiness for old vine vineyards in California. John Alban, Morgan Twain-Peterson and Tegan Passalacqua at the old vine seminar. Having the light bulb flick on about the treasure of old vine field blends. Some of the most exciting wines at the event were old vine field blends featuring a hodge podge of grapes like Mataro (Mourvedre), Syrah, Peloursin, Zinfandel, Petite Sirah, Trousseau noir, Grenache, Mondeuse, Alicante Bouchet and the like inter-planted and fermented together. In an industry dominated by monoculture and mono-varietal wines, the character of these field blends like Carlisle’s Two Acres and Bedrock’s Gibson Ranch are off the charts. And no one is intentionally planting field blends right now. This truly is a treasure of the past when farmers, rather than viticulturists, just kind of did their thing and let what would grow, grow. That kind of proposition is way too risky today but that only heightens the importance of saving these old vineyards and supporting the wineries who source fruit from them. As a Millennial, the character and stories behind field blend plantings is the perfect antidote to the mind-numbing boredom of the “same old, same old”. Millennials are changing the wine industry with their craving for new experiences and new things as well as authenticity–which an old vine field blend delivers in spades. It’s why I’m skeptical that Cabernet Sauvignon will continue it dominance and why I don’t think Merlot’s downturn is just because of a movie. Potek Winery’s Mormann Vineyard Syrah from the Santa Rita Hills. Great wine but Potek’s labels are WAAAAAAY too busy. Admittedly in a wine shop I wouldn’t even give them a second look because they’re so hard to read. Screw Pinot. Let’s start drinking Santa Barbara County Rhônes. I mentioned this in my quick take on Day 1 and day 2 only reaffirmed how special these cool climate Rhônes are. I’ll also add the Russian River Valley of Sonoma because not only can you find Carlisle’s Two Acre gem there but I was also thoroughly impressed with the wines from MacLaren. When you have wines like a 2005 Guigal La Turque being poured at the seminars, it would be easy to fill up this list with nothing but seminar wines. But there were a lot of fantastic wines poured at the Opening and Closing tastings so here are 10 of my favorites in no particular order. 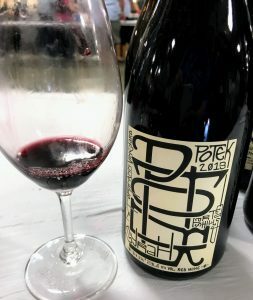 2016 Jada Hell’s Kitchen Paso Robles — It was actually hard to narrow down just one of the Jada wines to put on this list because every single one of them were stellar. This one was very full bodied and hedonistic with rich dark fruit, velvety smooth mouthfeel and a long finish with dark chocolate notes. 2016 Louis Cheze Condrieu Pagus Luminis — Crisp but mouthfilling. Lots of fresh tree fruit notes–apricots and peaches–with some stony minerality. While I enjoyed the opportunity to try Saxum, I’m actually far more excited about the wines being made by their assistant, Don Burns, with his wife Claudia at their Turtle Rock Winery. 2016 CR Graybehl The Grenachista Alder Springs Grenache Mendocino County — I guess I could add this to my cool-climate Rhône discoveries. Like Jada, this was a hard one to narrow down because I loved everything from this producer. The Alder Springs had a particular vivacious mouthfeel of juicy blackberries with some spice and floral notes. 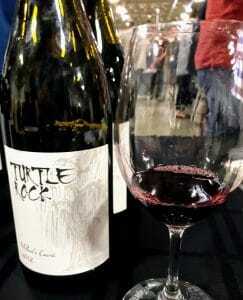 2012 Turtle Rock Willow’s Cuvee Paso Robles — Made by the assistant winemaker of Saxum. Truthfully, I liked these better than the Saxum wines I tried. Very floral with a mix of red and dark fruit. One of the best noses of the night. 2012 Dos Cabezas Wineworks El Campo Sonoita Arizona — One of the surprises of the event. A Tempranillo-Mourvedre blend from Arizona that tasted like a spicy Ribera del Duero and juicy Jumilla had a baby. Very impressive. 2008 Kunin Alisos Vineyard Syrah Santa Barbara County — Winners across the board from Kunin. Great mix of dark fruit and earthy forest floor. Very long finish. These were wines I wished I had more time to savor. 2012 Le Vieux Donjon Châteauneuf-du-Pape — This hit my perfect catnip style of savory, meaty undertones wrapped around a core of juicy, mouthwatering fruit. Such a treat to have and I suspect that the 2015 will be even better with a few more years. 2007 Carlisle James Berry Syrah Paso Robles — All in all, Carlisle probably made my favorite wines of the entire event. I can still taste the 2016 Two Acres from the old vine seminar but this James Berry was a close second. Still very lively with dark fruit, mouthwatering medium-plus acid and some spicy minerality on the finish. A 100% Cinsault pet-nat was not only geeky good but also a palate savior. Would really love to see more sparkling wines like this at future Hospice du Rhone events. 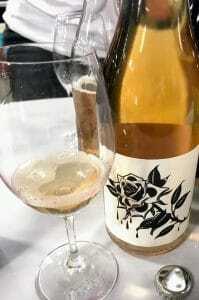 2017 The Blacksmith The Bloodline Cinsault Pet-Nat Darling W.O. South Africa — This was much needed salvation for the palate (see below) but it would have been a treat to try under any circumstance. Super geeky Cinsault pet-nat, this wine had a huge nose of orange blossoms and cherries that jumped out of the glass. 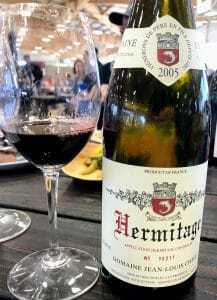 2005 Jean-Louis Chave Hermitage — This wine wasn’t part of any featured tasting and was certainly an unexpected treat that someone brought to the Live Auction lunch on Day 2. This was my first Chave and my lord! Still quite young and powerful for its age with layers of red fruit, savory Asian spices and a long finish of smokey BBQ notes. While overall the event was fantastic, there were two things that stuck out as minor negatives. One was the absence of sparkling wines which are the guardian angels of the palate at tastings like these. As readers of my flashback review of the 2017 Taste Washington know, periodically taking a break from big, heavy reds with some palate cleansing bubbles is a must if you’re going to maximize your tasting experience. There were a few producers pouring some roses and crisp white wines which helped but it was disappointing not to see more sparkling examples. I know that the Rhône is not particularly well known for bubbles but there is the Clairette de Die and Saint-Péray AOCs producing sparkling wine and Australia has a good tradition of making sparkling Shiraz. I’m sure there are also examples from New World producers experimenting with sparkling Viognier and other varieties. It would be great to give these wines more visibility and they would be absolute god sends during the big tastings. While some of the “clickiness” at lunch was disheartening, the gracious couple who shared this wine from their table gave me an amazing thrill that was a joy to try. The second negative was how “clicky” the culture among the attendees were–especially at the lunches. It’s wonderful that the Hospice du Rhône is in its 22nd year and it’s clear that there are many people who have been attending this event regularly. But for a “newbie”, it felt hard at times to break into the crowd. Again, this was most felt at the lunches where several times seats and entire tables were reserved not by official organizers but other attendees who didn’t seem to have any interest in interacting with people who weren’t part of their local scene. But there were certainly more than enough gracious attendees who were welcoming and approachable (as well as the organizers themselves like John and Lorraine Alban, Vicki Carroll and Faith Wells) to make the event exceedingly enjoyable and well worth attending again. Tagged Alder Springs, Alicante Bouchet, Alisos Vineyard, Arizona wine, Australian wine, Bedrock Wine Co, Billo Naravane, Cabernet Sauvignon, Carlisle Winery, Châteauneuf-du-Pape, Cinsault, Clairette de Die, Condrieu, CR Graybehl, Darling W.O., Dos Cabezas Wineworks, Faith Wells, Field blend, Gibson Ranch, Grenache, Guigal, Hermitage, Hospice du Rhone, Jada Vineyard, James Berry Vineyard, Jean-Louis Chave, John Alban, Jumilla, Kunin Wines, La Turque, Le Vieux Donjon, Louis Cheze, MacLaren Wine, Master of Wine, Mendocino, Merlot, Mondeuse, Morgan Twain-Peterson, Mormann Vineyard, Mourvèdre, palate fatigue, Paso Robles, Peloursin, Pet-Nat, Petite Sirah, Pinot noir, Potek Winery, Rasa Vineyards, Rhone wine, Ribera del Duero, Rosé Wine, Russian River Valley, Saint-Péray, Santa Barbara County, Santa Rita Hills, Saxum Vineyards, Sonoita, South African wine, Sparkling wine, Syrah, Taste Washington, Tegan Passalacqua, Tempranillo, The Blacksmith Wines, Trousseau noir, Turtle Rock Winery, Vicki Carroll, Zinfandel.